I rarely shoot stuff to be broadcasted (so the broadcast quality codecs are good to have, but weren’t a deciding factor for me), I mostly film corporate videos and sports events. Previous to this I mostly used C100’s, EX3’s and DSLR’s. My aim for this review/babel is to provide the information that I would to have liked to see before I bought it. So, am I glad I bought this camera? Yes, definitely! Is this camera perfect? God no! We’ll start with the reasons I chose it….. The C100 is a BEAUTIFUL camera to use, however its lack of ability to do any form of slow-motion put it out the window straight away, obviously there’s the C100 MK2 that does 60 FPS but even thats a bit crappy if we’re being honest. One option I did consider is getting the C100 and the Panasonic GH4 for the slow motion which is truly unbelievable to use, and something that I will buy in time, but I decided against this as it would mean needing to have two cameras on me all the time and the 90FPS although good isn’t in the same league as the others. The C300 wash never really an option, its out of my price range, doesn't do 4K or slow-motion but I thought I should at least mention it in here. The next option was the FS700, I confess when I first saw the price drop my first thought was shut up and take my money, I mean a grand off the original price, thats appealing! However the internal codec is pretty crappy so I’d need an external monitor, 4K would be nice so thats either a 7Q which is crazy dollar or the new Shogun. I quickly got a quote for the FS700, all the bits like batteries, metabones (more on that later) cards, mic, bag etc and a Shogun which came in at a little under £6000 Exc VAT. This seemed pretty good, however they knew I was interested in the FS7 so they also sent a quote over for the FS7 (which i wouldn't need an external recorder for) and it only worked out a little more expensive. Balls, thats a tough choice! I eventually went for the FS7 because its a newer camera, and all internal. The FS700 would have needed a lot of money throwing at it with EVF’s, grip relocater’s, recorders etc that I decided I was basically going to end up spending more money on it than the FS7 would cost me. The only sticking point was the 200FPS vs the 150 on the FS7 (or 240 vs 180 if you’re in NTSC). However after using it the 150 is absolutely fine and I managed to slow it down to 25% speed using optical flow, although this wasn't on a busy scene so I couldn't say if this would be possible in every situation. Ok so first impressions (the good ones)…. As previously said I’ve only used this so far on a few test shots, (mainly on my poor girlfriend who was trying to watch tv with a softboxed 1K in her face) and since its raining relentlessly it looks like I won't get chance today. Straight out the box the menu feels familiar to the EX3, granted it’s a lot bigger in the number of choices but it’s easy enough to navigate. The joystick on the grip is similar to the one on the C100 and as a result is easy to use and flick through the menu, however sometimes selecting something can be a bit tricky as you can accidentally press left or right, but overall its nice and easy to use. The codec choices are very nice, I went straight for the MPEG-4 4:2:2 10bit 50Mbps as it seemed to give me the most record time/data and when I got it into post it could be pulled apart without coming to bits at all. The other options are XAVC I which is still 422 10bit and XAVC L which is 4:2:0 8bit with a variable bitrate. The longest record time you can get out of this camera is with it set to 35Mbps, ideal for if you’re filming generic talking heads for a long time. One thing that is worth noting is that you can’t shoot any form of slowmo in MPEG- 4, only in the XAVC codecs. I’ve tried out all the codecs and all of them are excellent when you get them into post, you can push them and pull them about to your hearts content and they wont fall to bits. There is a bit of noise in low light at the higher end of the ISO but thats to be expected. The 4K is great and the detail it captures is truly impressive, however it absolutely eats through storage space so for me this is something that will be reserved for the special jobs. Right onto the annoying stuff, of which I have to admit there is plenty…. The "nob" which stops the handle going fully horizontal can be seen here to the right of the thumb screw, as can the nice scratch that happened within 5 mins of opening the box due to the (plastic) screw rubbing on it. This leads us nicely onto the 2nd issue I have, which is if you do try and lift it up, and turn the plastic thumb screw, if it happens to rub on the metal surface you’ll get a nice shiny scratch. Now given the fact that this is a £5000 camera it should take more than this to damage it. This can also be seen on the picture above. You can put it on a tripod if you put the handle fully backwards, which actually makes it very nice to use, and is the position I’ve adopted for it, however if you do this it makes the HDMI port VERY difficult to get at. Actually I lied, the first thing I noticed when I went to see the pre-production model was the (in my opinion) stupid hot shoe thing on the front, yes I can see the appeal of having it, but the fact that you cant use it as a cold shoe without the risk of damaging it is crap. Two cold shoes on a camera is a must, as it one at the front. Why would I want my light at the back of my camera shining a light at my EVF? Granted I could go and buy the Sony one, but I’ve already got a good light so I don’t really fancy replacing it. Hopefully someone will bring out an adapter for it soon. If anyone has tried using it as a cold shoe let me know! Another slightly annoying oversight from sony is the fact that you cant change the monitor volume on the camera, it’s in a menu, in a menu, and you cant assign a user button to said option, I know this isn't a massive problem as I rarely change the volume even when I can but it does seem a bit silly. The first set of menu navigation required to change the monitor volume. Changing the volume with the menu system. The viewfinder is another slight gripe, its very stiff to twist, which is great, however if you take the loop off, whenever you try and change the angle of it the force required to move it causes the screen to do the thing where you push on an LCD screen (thats the only way I can describe it). This is slightly worrying. I'm just going to list the other issues as it seems like I’m complaining a lot about this camera, which is wrong because I do actually really like it, it just has some, erm, teething problems is probably the best way to describe it, and hopefully Sony will sort it out with the next firmware update. The scroll wheel on the grip and the camera is WAY to slow, it takes far to long to scroll from extreme to the other. Despite what Sony say, It’s not a shoulder mount camera straight out the box, it can be used which is nice but its by no means comfy to use. If you change codec it seems to loose some of its settings, i.e the shutter speed/angle and S&Q frame rates. Despite those issues, of which some can hopefully be fixed by a firmware update and some are a bit of a fudge up from Sony I’m very happy with my purchase. Im sure if you’re reading this you’ve read the other reviews that mention about the waveform monitor, speed booster problems etc, I’ve not experienced these yet (fortunately). For me the speedbooster is incredible, and I’d recommend it to anyone. The effective full frame sensor you get from it gives a really nice look and makes lenses far more dynamic and usable. 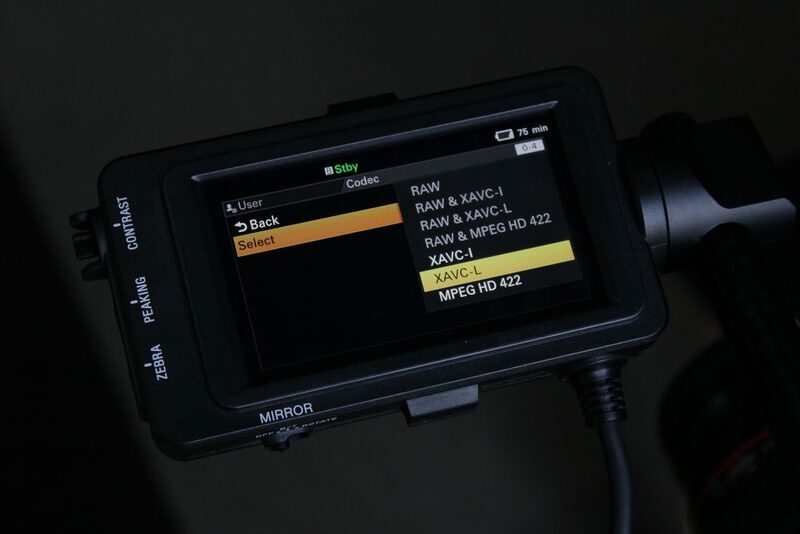 The update next year is for internal prores, the camera will currently output 4K out the SDI’s and a clean signal so a recorder like a Shogun would be able to record it, this would make the media needed a lot more affordable (£105 for 240GB for an SSD vs £175 for a 64GB card) so this is something I’ll look at doing in time. Hopefully soon I’ll have some test footage I can put up that my girlfriend wont kill me for putting online, and a more in-depth video review when I’ve used the camera more, but that this point I wouldn't be able to say much more than I have in this. The cards it uses are crazy expensive but are very fast, and these may come down in price but it’s doubtful as SXS cards didn't really. This is only intended to be a quick insight to my first thoughts on it, if you have any questions regarding it please feel to ask and I’ll help you out as best I can, I’ve probably only explored half of what this camera can do so far so I still have a lot to learn about it.